This page has been archived here from official Square Enix sources. It was originally posted on 11/07/2011. Gil-making godsend or continental calamity? Never blinking and all-seeing, The Mythril Eye misses naught that transpires within the lustrous realm of coin. In today's emergency bulletin, senior editor Havak Alvak reports on the crisis unfolding to the north in Coerthas, and examines the implications thereof. Word has arrived from our northern field correspondent directing us to a disconcerting disturbance unfolding in Ishgardian Coerthas. House Fortemps, one of the financially foremost families of the Holy See of Ishgard, has apparently assembled a substantial military contingent at the hamlet of Owl’s Nest. If this information has reached us in full fidelity - and there is no indication otherwise - the contingent, formed of knights and sellswords, has been mobilized for a most mystifying motive: the liberation of the Dzemael Darkhold. Before I proceed, pray permit me to ponder a pair of points. First, it is common knowledge that the Dzemael Darkhold was intended to be Ishgard’s bastion in their continuing conflict against dragonkind, a flawless fortification from where they would wage war against their ancient adversaries. Second, it had earlier been revealed that the Ishgardians had met with a quandary in the quarrying effort, which should have triggered a tangible tightening of defenses. What formidable force, then, could have mastered the martially minded Ishgardians in a position as well-defended as the Darkhold? In endeavoring to establish an explanation, our correspondent tracked down a man-at-arms who was witness to the fall of the Dzemael Darkhold. According to the scar-streaked sellsword, work had been proceeding purposefully to prime the cavernous cavities and craggy corridors of the Darkhold for use as a fortification. All this came to a screeching halt, however, when what appeared to be an expertly etched effigy of a fiend was turned up in the midst of mining. The Ishgardians set about excavating it, only to have the seemingly soulless statue suddenly spring to life the instant they tried to move it. Lifeless no more, the fiend flew into a fit of frenzy, murdering a motley of miners and injuring innumerable others. Knights and hired hands alike hurled themselves into the fray in a venture to vanquish the virulent fiend. Unbeknownst to them, however, at the precise moment they rallied to arms against the malevolent menace, Imperial troopers had stormed the Darkhold's entrance. The clash - if it could be called such - was sealed in a score of seconds. The Ishgardians swiftly succumbed with scarcely a struggle, and it was all our interviewee could do to flee with his life. 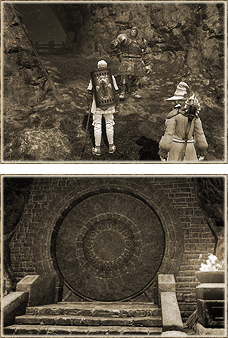 After several years spent in silent slumber, has the Empire really roused to resume its march on Eorzea? If so, what implications could this hold on the province of profit? Commenting on the conceivable consequences, Mythril Eye economist Tzetzelun speculates that the anticipation of armed conflict will send the price of wheat, grains, and other sundry supplies soaring. The armaments market, on the other hand, can expect to undergo furious fluctuations for the foreseeable future. An event of far-reaching impact has been set in motion, but the hour is yet young. The Mythril Eye shall sustain its surveillance of the situation in Coerthas, that our readers might be properly prepared to confront the coming chaos in the commercial climate.